A poll by YouGov - the team behind the election polls - has given us an answer that might just settle the nation. Or enrage it. The study suggests that, scone pronounced with a short 'o' sound, is the more popular way of saying the name of the very British cake. But it's a close call, with 51% voting that the name rhymes with gone and 49% rhyming it with bone. 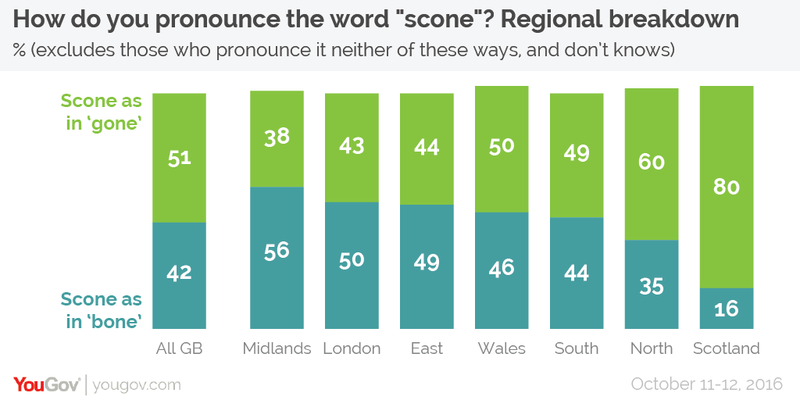 The study also found that the way you say scone also depends on whereabouts in the country you're from. If you're from the north (60%) or Scotland (80%), you will probably use a short 'o' sounds, whereas the Midlands (56%) are more likely use a long 'o' sound. If you're from London then it's 50/50 on how you pronounce it. People from a middle class background tend to use the ‘gone’ sound, where as those from a working class background are more evenly split. Now that that's sorted, can we just decide whether it’s jam then cream or cream then jam?